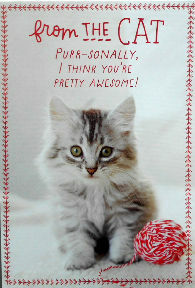 This Christmas card is from the cat. Outside greeting: Purr-sonally, I think You're Pretty Awesome. Inside greeting: And You Know How Picky I Am. MEOWY Christmas! This card is 2 5/8" wide x 6 3/4" high. Red envelope included.